On the anniversary of her dardevil brother's death, Jaycee attempts to break into Jake's favorite hideout—the petrifying ruins of an insane asylum. Joined by four classmates, each with their own brand of disfunction, Jaycee discovers a map detailing her brother's exploration and the unfinished dares he left behind. This was a super sweet novel about a variety of characters in a sense coming of age. The settings of this book were a lot of fun, often places that an urban explorer would dream about. 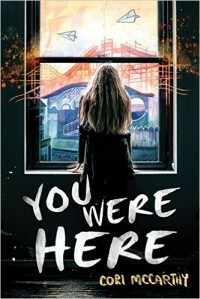 I loved the detail used, especially about the theme park, and how easily I could feel the adrenaline rush and the tension that would come from exploring each location. Though the story was told from five points of view, only one was in first person which made it a whole lot easier to follow. I felt most connected to Natalie even though she wasn't the main character. The five were also extremely different and had their own backgrounds and ideas which made them a rather unlikely cohort, but a very amusing one. One character's section was told in a graphic novel sense, and one in graffiti art. While I'm not usually very appreciative of art, I thought the illustrations were absolutely gorgeous and really added to the story. They were also very representative of the characters and contributed to the overall theme. I loved how this dealt with various different problems that the blurb entirely misses out on. Jaycee might have the biggest problems, but she's in a way looking for the most attention and she gets this throughout the story. This book was a solid read with gorgeous underlying messages, but I ultimately liked it the most for its creative settings.